The robot revolution on Wall Street, which combines huge processing power and artificial intelligence, is nothing new; it’s been going on for years. First, Wall Street automated routine payment-processing tasks and a large portion of back office settlement and clearing. Next came trading functions. Automated order entry and matching replaced humans who had formerly acted as stock specialists. Finally the robots started to replace wealth managers. If you’ve ever opened an account with a large wealth management firm and had your adviser ask you about your age, planned retirement date, goals in retirement, current savings, etc., and then turn around and recommend a set program of future savings with a formulaic approach to stock and bond allocations, you may have thought to yourself, “Hmmm, a computer could do this.” You’re right, a computer can do it, and they are. Wealth management and asset management together are projected to lose over 230,000 jobs to computers in the next seven years, according to this article. But, there’s a dark side to automation that’s far worse than just the loss of jobs. The computers are being programmed to perform asset management and trading tasks at a time of low volatility and unprecedented gains in stocks. As prices go higher, the computers allocate more money, which drives prices higher still, which leads to more money being allocated and so on in a feedback loop that knows no bounds. What happens when markets break, which they inevitably do? 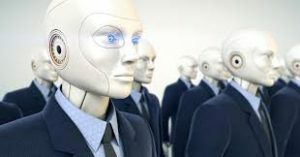 Who will stand up to a wave of sell orders coming from all the robots at once? This could look like the Oct. 19, 1987, crash (22% in one day) on steroids. Computers can be taught to match orders and allocate assets, but they don’t know how to navigate the fear and panic that comes with a market crash. The most likely outcome is that the robots will make the next crash worse than any human-caused crash before.